Here is an image of some ISM and dark nebulae. 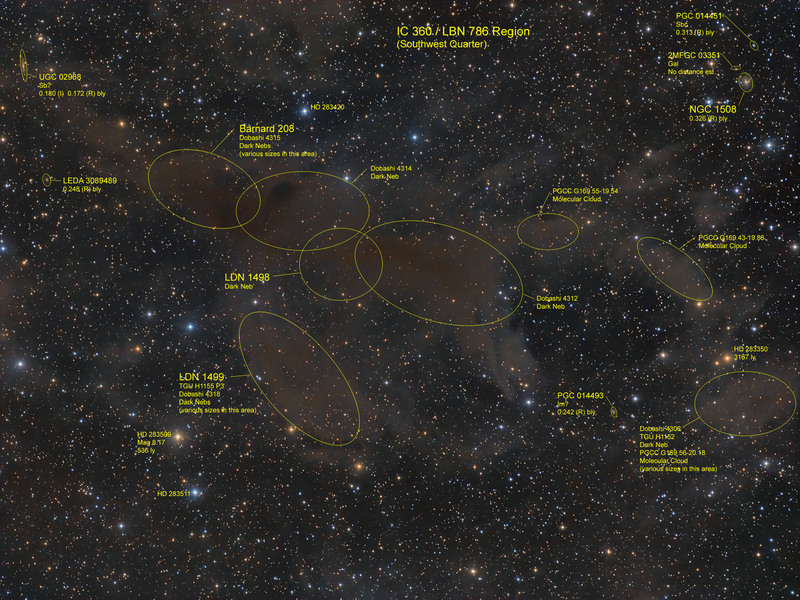 This field is essentially the southwest quarter of LBN 786 (aka IC 360). The most prominent dust is a series of Dobashi dark nebulae that also encompasses Barnard 208. The field also contains dark nebulae LDN 1498 and 1499 as well as other dark structures noted in the TGU, Dobashi, and PGCC (Planck Catalog of Galactic Cold Clumps) catalogs. There are several background galaxies - the most notable is NGC 1508 with a redshift distance estimate of 326 million light years. Others (UGC 02988, PGC 014451, 014493, LEDA 3089489) are annotated and have distance estimates from 180 to 326 million light years. UGC 02988 had a SN in 2014. Image and details can be accessed form the link below. Link to a larger image is on the main image page. For convenience, I have a link below to the annotated image - but it can also be accessed from the main image page as well. Edited by ngc7319_20, 13 March 2019 - 02:28 PM. Very nice! Love interstellar dust. It is always interesting how many galaxies you can find in these fields... Always seems to be at least one. Yep, galaxies abound, can't help to catch them on many images. But the image scale on these wide field shots generally do not do justice to to these visually small galaxies. As a well known person in the PixInsight community, you might be interested to know that I just started using PixInsight this year. I think that along with many fine PixInsight features, the TGV and MMT noise reduction process are really helpful with these dark nebula / dusty images where object signal level is pretty low. It took a little study to learn how to fine tune the settings, but along with judicious masking, they can make a big difference on these images. Glad to hear! In fact, it was a region in Taurus, a ways away from Pleiades, lots of dust and some reflection nebula, and a few galaxies, that really forced me to hone my NR skills in PI. Even with I think it was around 7 hours of OSC dark site data, the dust was still quite noisy. 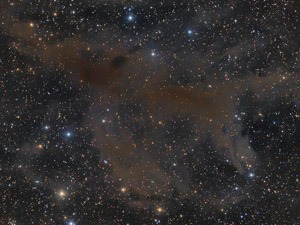 It isn't like emission nebula, these dark dusty nebula are much, much fainter most of the time.